Gujarati Litterateur Raghuveer Chaudhary honoured with 51st Jnanpith Award 2015. The decision was taken in a meeting of Jnanpith Selection Board chaired by noted scholar, writer and critic Prof. Namwar Singh. Other eminent persons of the selection board are Prof. Shamim Hanfi, Harish Trivedi, Prof. Suranjan Das, Ramakant Rath, Chandrakant Patil, Prof. Alok Rai, Dinesh Misra and Leeladhar Mandloi. 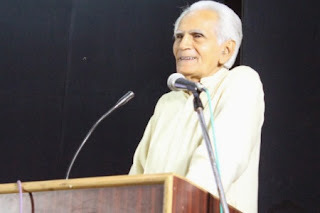 Author of more than 80 books, Mr. Chaudhary had began his writing career with novels and poetry, and later ventured into other forms of literature including plays, essays and short stories. Born in 1938 in Gandhinagar, the writer is a Gandhian and his works are largely influenced by literary figures like Govardhanram Tripathi, Kaka Kalelkar, Suresh Joshi, Ramdarash Mishra and G.N. Dickey. A prominent figure in the contemporary Gujarati literary scene, Chaudhary’s faith in the functional aspect of human life is voiced through his novels “Amrita,” “Venu Vatsala” and the “Uparvas” trilogy. Rudra Mahalaya is a landmark in Gujarati historical novel writing. His essays contain a combination of microscopic observations concerning the art of creative writing and a vivid presentation of thought. His style of writing tinged with his unique sense of humour adds to the readability of his essays. Jnanpith Award is a literary award in India. Along with the Sahitya Akademi Fellowship,it is one of the two most prestigious literary honours in the country. The award was instituted in 1961. Eligibility is restricted to any Indian citizen who writes in one of the 22 languages listed in Schedule Eight of the Indian constitution. Malayalam writer G. Sankara Kurup was first Jnanpith Awardee in year 1965.